On the sixth day of my UAE trip, I took a bus ride from Dubai to Abu Dhabi - an exciting three-hour journey on the Sheikh Zayed road. After spending five wonderful days in the golden city of Dubai, I moved my wagon towards Abu Dhabi. I was to spend three days in the capital city of UAE and I couldn’t hold my excitement any longer. But having spent 5 great days, I happened to have an attachment with Dubai and it was hard for me to bid farewell to the city. But I had to stick to the plan and take a bus from Dubai to Abu Dhabi. My day began with a bath, followed by breakfast. I must say that the breakfast at J5 Rimal was plain awesome. Everything was taken care of nicely. Food items were fresh and I was presented with so many options to choose from. I chose to sit outside and enjoy my breakfast in the company of the rising sun and mild wind. I observed the sun getting brighter as I sipped my coffee and fed my stomach some pleasant food items. I don’t remember the names of everything I had, but I remember having enjoyed fruit bowl, juice, coffee, salad, chicken sausage, chicken salami, some sweet dishes and more. Upon my request, the chef made me some fresh waffles, too. I spent almost an hour and a half at breakfast and went upstairs. I picked my laptop from my room and gave a visit to the pool on the top floor. Letting the fresh dose of bright sunshine nourish my body, I browsed the internet for a while. I also made some plans for Abu Dhabi and made some changes on Parvezish before I convinced my mind (and body) that it was time to leave Dubai for Abu Dhabi. I went back to my room, got ready and went downstairs to proceed with checkout. I paid 5 AEDs for a phone call I made the other day, and I was done. Related: Read the full review of J5 Rimal Hotel Apartments, Dubai. The lobby man called in a taxi for me and I left J5 Rimal after thanking everyone for a great stay. 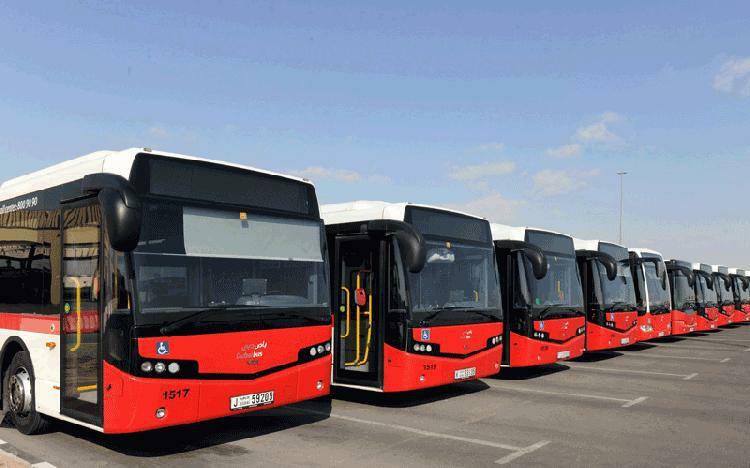 Dubai bus service is operated by Roads and Transport Authority (RTA). Founded as a Government of Dubai department in 2005, RTA plans and executes transport and traffic projects in Dubai. Dubai bus service has an extensive network and operates within the city as well as between other cities of UAE. At the time of writing this, RTA operates 2700 bus stops in Dubai, including 636 air-conditioned stops. One of the best ways to transit between the emirates of UAE is to take an intercity bus. RTA of Dubai operates 11 intercity routes and you can travel between any city of UAE to and from Al Ghubaiba bus station of Dubai. I soon reached Al Ghubaiba bus station, the central bus station of Dubai. From here, I was to take an intercity bus and bus number E100 – Al Ghubaiba to Abu Dhabi central bus station was the one I was looking for. In order to board a bus from Dubai to Abu Dhabi, you need to have a valid ticket for your journey. You can purchase a ticket from the counter. An easier way will be to carry a Nol card, though. A Nol (meaning ‘fare’) card is a pre-paid smart card which can be recharged as required. This card can be used to board a metro train or a bus in Dubai. You can purchase a Nol card from the airport (airport metro station), or from a bus station. For a temporary visitor, a silver Nol card should be fine. The silver Nol card carries a validity of 5 years and can be purchased at the price of 25 dirhams (you get a balance of 19 dirhams). The first thing I had to do before I boarded the bus was to recharge my Nol card. My card didn’t have sufficient balance – the reason I had to wander around the roads of Dubai for more than an hour the other day! Travel Tip: Always make sure to have sufficient balance in your Nol card otherwise you will not be able to board a bus or a metro. I got my card recharged and joined a long queue of passengers waiting for a bus to Abu Dhabi. There were a lot of passengers waiting for the bus to arrive. It was going to be a while before our bus arrived and be ready to be boarded. I looked around for a while, looking for someone to talk to and a guy soon joined the queue behind me. He was Damian from Cameroon. It was a hot day and we were sweating like anything. This hot day turned out to be our conversation starter and we both ended up bonding with each other soon. Looking at me sweating in all my glory, Damian offered me his bottle of water, which I politely denied as I had my own lying in my backpack. As we stood there talking, a bus arrived and we were soon able to board it – ready to leave from Dubai to Abu Dhabi. Finally entering the bus brought us a great amount of relief. Our fleet for the day was a Mercedes-Benz bus (if I remembered correctly), with a central air conditioning system. “Thanks for thinking about us, Dubai government” I thought as we rest our butts on a comfortable seat. This low-floor bus was disabled-friendly and had first three rows reserved for women and children. It was spacious, it was clean and it was soon to take us from Dubai to Abu Dhabi! 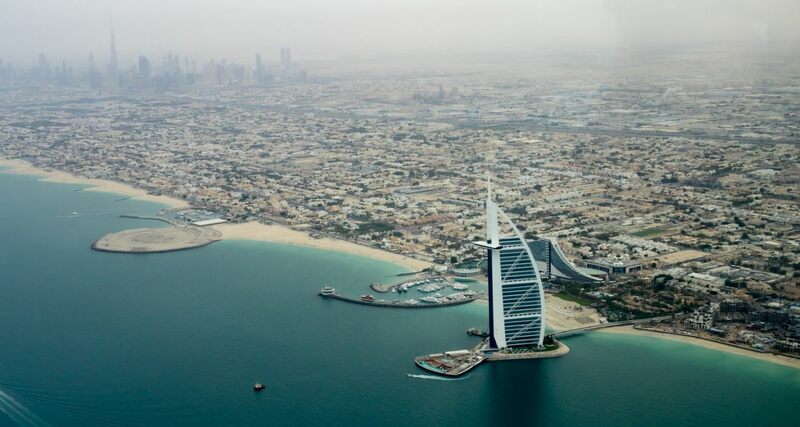 In its two and a half hour ride, the intercity bus takes you through many areas of Dubai, before it takes the Dubai – Abu Dhabi highway on the E11 road. The E11 road, known as Sheikh Zayed Road in Dubai, is the longest road of UAE. Spanning from the emirate of Abu Dhabi to Ras-al-Khaimah, the E11 road is almost 560 kilometers (348 miles) long. Needless to say that E11 is one of the busiest roads in UAE. On your way from Dubai to Abu Dhabi, you get to see tall and beautiful skyscrapers just about everywhere you look. Enjoying the scenery, I and Damian spent most time of our journey talking about different topics. Damian had migrated to UAE along with his brothers and cousins from his hometown in Cameroon – where most of his family still reside. An enthusiastic, hard working guy with a dream and a big family to feed – is how I can describe Damian. He was very clear about his goals and his dream was to become his own boss one day. He was going to Abu Dhabi after leaving a job in Dubai due to some issues at his workplace. I didn’t realize when we entered Abu Dhabi and it wasn’t long before we were already at the central bus station. Our journey from Al Ghubaiba, Dubai to Abu Dhabi central bus station took almost 3 hours. Damian was getting late as he was supposed to reach his new place of work. I took his number and gave him mine before we bid farewell to each other. I promised to call him soon and we parted our ways. Damian disappeared soon, and I sat on a bench and opened the map on my phone to determine the directions to my hotel in Abu Dhabi. After spending about 10 minutes at this, I started moving in the direction of my hotel. With other options available for the same, Dubai’s intercity bus is the best way to reach Abu Dhabi. The journey takes about two and a half hour ideally and costs 25 dirhams. During my bus journey which stretched to three hours due to traffic, I had a long conversation with my newly made friend – Damian. This guy from the African country of Cameroon came out as a good companion during this long journey. While it was hard for me to leave Dubai – a city I fell in love with, I was excited that I was finally in Abu Dhabi. I was soon to reach my hotel and a new city was ready to be explored! What about you? Have you been to UAE? Have you taken a bus ride from Dubai to UAE or drove a car? Do share your experience with me! This was Parvez and you were reading A Bus Ride from The Golden City Of Dubai To Abu Dhabi – The Capital Of UAE on Parvezish. I hope you found this article interesting and if you did, I would like it if you share it with others. I will be back with a new blog entry soon. Until then, get lost somewhere and keep wandering!